What does that mean? I’ll tell you…but a little background first. Sometimes I go in directions I never imagine when I’m writing, and end up adding a subplot that I certainly didn’t plan. 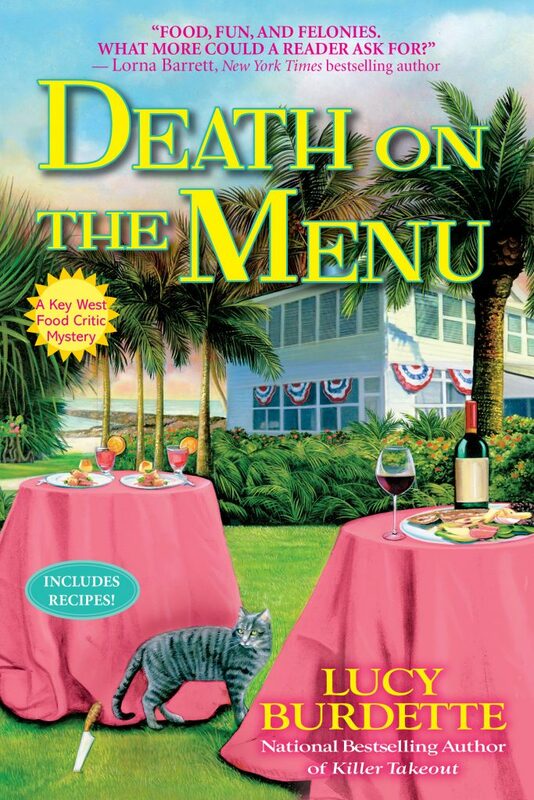 For example, in DEATH ON THE MENU, food critic Hayley Snow is checking out a suspect and discovers that he is a Hemingway wannabe. And then while googling and studying up on Hemingway, I learned that there actually was a contest for “Really Bad Hemingway” in which contestants submitted a page of bad Hemingway-esque writing and prizes were awarded. So then of course I had to write a page that this character had supposedly written. The man and the guide had been at sea for hours, and reeled in two marlin. Both of them were big as Spanish bulls and that strong too; heaving silver bodies, that glinted in the sunlight and left the man and the guide breathless. By the end of Rusty’s recitation, I was laughing too hard to speak. Lucy again: Are you a fan of Hemingway’s writing? why or why not? Food critic Hayley Snow is thrilled to be working at a three-day international conference at the Harry S. Truman Little White House. But things get off to a bad start when Hemingway’s Nobel prize gold medal (which belongs to Cuba and is on display for this weekend only) disappears. And they only get worse when a body is discovered in the storeroom.Hayley must spring into action before the killer adds another victim to his menu. This entry was posted on Monday, September 3rd, 2018 at 4:27 pm	and is filed under Blog, Books. You can follow any responses to this entry through the RSS 2.0 feed. You can leave a response, or trackback from your own site.